Ritter Pharmaceuticals’ (NASDAQ:RTTR) lead product candidate, RP-G28, which recently entered Phase 3 clinical trials, has the potential to become the first prescription therapy for lactose intolerance, a condition that causes millions worldwide to avoid dairy products. “While there is no FDA-approved drug for lactose intolerance, surveys have shown that 60% of patients, and there are 40 million of them in the U.S., are seeking a better solution,” Andrew Ritter, co-founder and CEO, says in an interview with BioTuesdays. RP-G28 is a powder to be mixed with water and taken twice daily during a 30-day course of treatment. “Early results suggest that one course of treatment may provide long-lasting, durable relief. And assessment of re-treatment safety and efficacy is underway,” he suggests. Mr. Ritter explains that lactose intolerance symptoms in the GI tract are the result of bacteria in the gut fermenting lactose and causing gas production. The excess gas production can lead to symptoms of abdominal pain, bloating, flatulence, cramping and water retention in the gut can lead to diarrhea. RP-G28 modulates the gut microbiome and is designed to stimulate the growth of lactose-metabolizing bacteria in the colon, he contends. 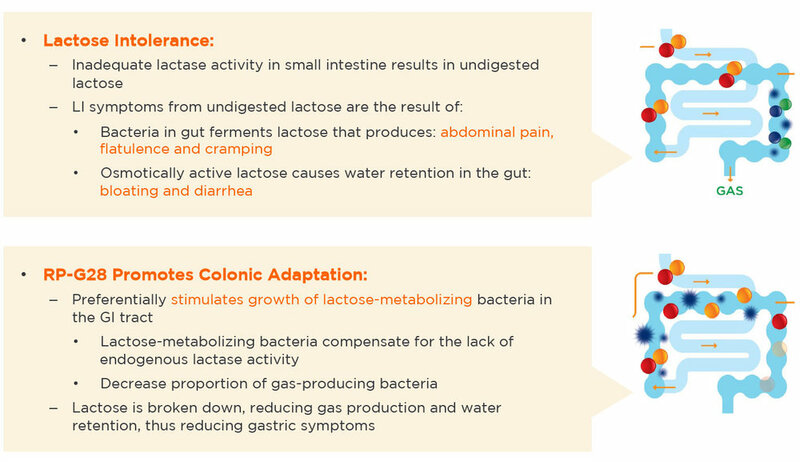 As a result, lactose is broken down, reducing gas production and water retention, which in turn, reduces the gastric symptoms associated with lactose intolerance. The company estimates that 20% to 30% of patients may need a re-treatment with RP-G28 following some sort of gut-disrupting episode, such as taking antibiotics or not eating dairy for a long time. “But all things being equal, most patients should remain tolerant for a long time,” Mr. Ritter says. Of the 40 million people in the U.S. with lactose intolerance, some nine million are moderate-to-severe patients, which Mr. Ritter says would be the company’s initial target market. The estimated incidence of lactose intolerance in Europe is 65 million people, with 90 million in Japan. Mr. Ritter co-founded Ritter Pharmaceuticals in 2007 as a result of his own personal affliction with lactose intolerance. So he enlisted a team of clinical, manufacturing, and regulatory professionals to develop RP-G28. Since 2014, he has served as the company’s president, and was appointed CEO in June 2018. The company has more than 30 global formulation, methods of use and manufacturing patents, with 15 patent applications pending. Most patents expire in 2030. However, additional pending claims may extend patent life much further. As a new chemical entity, RP-G28 may be entitled to periods of regulatory market exclusivity in the U.S. and Europe, if approved. In an earlier Phase 2a study with 62 patients, the company established the mode of action for RP-G28, the concept of “colonic adaptation,” as well as no serious adverse events. The findings were published in the peer-reviewed journal, the Proceedings of the National Academy of Sciences in 2017. A subsequent Phase 2b study with 377 patients established efficacy, an optimal dose and a safety profile for RP-G28. The primary endpoint was the proportion of patients that had a meaningful reduction in lactose intolerance. On analysis of the clinical trial, the company found that after a for-cause-audit, one of its 15 study centers differed in not following good clinical practices, and as a result, the trial narrowly missed statistical significance. “When we pulled this center’s data out of the results assessment, we analyzed the remaining subset of 296 patients from 14 study sites, and this subset met the trial’s primary endpoint with a statistically significant result,” Mr. Ritter notes. In addition, this subset demonstrated a 14-percentage point difference in efficacy between RP-G28 and placebo in the Phase 2b trial, which compared favorably to recently FDA-approved GI drugs that average an 11-percentage point difference from placebo, he adds. Among secondary endpoints, the Phase 2b trial found that a significant percent of treated patients reported elimination of lactose intolerance symptoms, compared with placebo. In addition, treated patients nearly doubled their consumption of milk and had improved quality of life. According to Mr. Ritter, the gut microbiome data from the Phase 2b study also demonstrated that RP-G28 had a dramatic increase in the species of bifidobacterium in the GI tract, compared with placebo. These results were consistent with the Phase 2a study results. “As we learn more about how our product is doing in the gut, we believe it has great potential in other GI diseases as well. Thus, we are starting to explore additional indications,” he adds. At the end of June, Ritter began its first Phase 3 trial with design input from the FDA, which includes, among other things, real-time data monitoring to help ensure site and data quality. The purpose of the initial pivotal study is to determine the efficacy, safety and tolerability of RP-G28 to treat lactose intolerance, compared with placebo, with an estimated enrollment of 525 patients across approximately 28 sites in the U.S. The protocol design includes a two-week screening period, a randomized 30-day drug treatment period and a 90-day period to assess drug response and durability of effect after treatment, as patients consume their normal diets, including dairy products. There will be a second re-randomized, 30-day drug treatment period to assess safety and efficacy of a repeat round of therapy. The primary endpoint will be the mean change in lactose intolerance symptom composite score post-treatment, compared with baseline. The company expects to report results from the large-scale clinical trial in the second half of 2019. “Our focus is to partner RP-G28 with a commercial company that has a specialty in GI diseases,” Mr. Ritter says, adding that the company is in various stages of discussions with potential partners. To connect with Ritter Pharmaceuticals, or any of the other companies featured on BioTuesdays, send us an email at editor@biotuesdays.com.